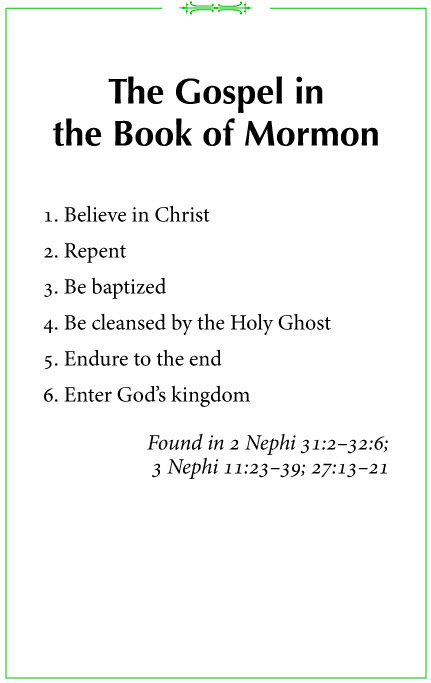 In three major statements about the gospel of Jesus Christ, the Book of Mormon highlights certain principles and ordinances that a person must follow or have completed in order to come fully unto Christ. The gospel of Christ, centered in the atonement, includes belief, repentance, baptism, receiving the Holy Ghost, enduring to the end, and ultimately entering the kingdom of God. The systematic listing of these six elements in 2 Nephi 31, 3 Nephi 11, and 3 Nephi 27 suggests that when the Nephites spoke about the "gospel," they meant particularly these six principles and ordinances.